If you were hurt in a Wynwood Uber car accident, you can call Miami Uber accident lawyers at the Wolfson Law Firm for assistance. Since 1963 our Miami personal injury lawyers have helped injury victims after all types of accidents. We represent Uber drivers and Uber passengers for personal injuries and damages throughout South Florida. We offer free, no obligation consultations. Just call our Miami Uber accident attorneys at (305) 285-1115 so we can answer your questions following your Wynwood Uber car accident in Miami. The Wynwood Arts District in Miami has dozens of retail stores, art galleries, antique shops, bars and restaurants. It is also home to perhaps the biggest open air street art installations known to the world. In 2009 the Wynwood Arts District Association began operations. It is set up to maintain and improve the Wynwood Arts District which is one of the more prominent and biggest creative communities in the country. The neighborhood used to be a manufacturing and warehouse district just north of downtown Miami. Creative developers restructured and rehabilitated unused buildings, old factories and empty warehouses into a completely unique arts district. Today Wynwood is home to art galleries, complexes restaurants, bars, cafés and performing art locations. The Wynwood Arts District in Miami is a popular destination for locals and tourists alike. Many visitors to Wynwood take Uber or Lyft for a variety of reasons. In Miami, like most urban areas, parking is at a premium. Taking Uber eliminates parking concerns. Many responsible people choose to use Uber to avoid driving after drinking alcohol and risking criminal penalties and substantial injuries. Our Wynwood Uber accident lawyers are also noticing a trend among many young people who simply use Uber or Lyft as their main transportation option. Interestingly a number of people believe that the economic analysis of using Uber versus the ownership and maintenance of a personal vehicle favors the use of Uber or Lyft. 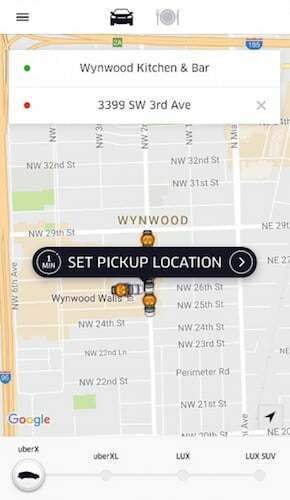 It is estimated that at any given moment in South Florida there could be more than 10,000 Uber and Lyft drivers on the road providing rides and also delivering food under the UberEATS app. Over the past few years as Uber and Lyft arrived in Miami and all over South Florida, our Miami Uber accident lawyers carefully watched the development of regulations and the ongoing negotiations with local and state government. As a result, Uber is now legally operating in Miami – Dade, Broward and Palm Beach County. One of the concessions made by Uber was to provide substantial insurance for the protection of Uber passengers and in some cases drivers. In fact, Uber obtained insurance coverage in the amount of $1 million. What remains to be seen is how Uber and its insurance carrier meet their obligations. Our Miami car accident lawyers presently represent a number of Uber drivers and Uber passengers in their claims for personal injury damages. A member of our personal injury team is a former driver for Uber and Lyft and provides us with valuable insight into the life of an Uber driver and passenger. We are able to take that insight as well as the information we discover in the number of Uber and Lyft cases that we have in the office to make sure that we maximize the recovery of all of our Uber accident clients. At the Wolfson Law Firm in Miami, our Miami car accident lawyers are available to help and represent anyone involved in an Uber car accident in Wynwood or anywhere in South Florida. Our lawyers understand the effect that a single car accident can have not only on you but your family as well. When we discuss this with clients we refer to it as the “ripple” effect similar to dropping a stone in the middle of an otherwise calm lake. That stone is the same as an unexpected and tragic accident. The car accident and resulting injuries impact not only the person who was hurt by their families, coworkers and friends. That is why our lawyers do everything in their power to make certain that your case is handled efficiently, aggressively and professionally. We handle all of our Uber car accident cases on a contingency fee basis. What that means is that you do not owe any attorney’s fees until and unless we make a financial recovery for you. We offer confidential and free consultations. Call us at (305) 285-1115 let’s get to work on your Wynwood Uber accident case. Our Miami personal injury lawyers offer full personal injury legal representation to the people of Wynwood as well as Edgewater, Midtown, Brickell, Key Biscayne, Aventura, Doral, Hialeah, Weston, Miramar, Miami Beach, Hollywood, Pembroke Pines, South Beach, Coconut Grove and Coral Gables.